Manufacturer of a wide range of products which include aluminum tubular ladder, trolley step ladder, aluminium telescopic tower ladder, aluminium trolley ladders, aluminum trolley step ladder and jeep mount ladders. Considered as a trusted name in the market, we bring forward an exclusive range of Aluminum Tubular Ladder. Following to the market set norms and a guideline; offered products are best in quality and provide optimum performance. 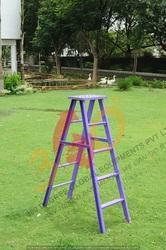 These ladders are made by using finest quality raw material in line with set global norms and standards. In addition to this, we check our entire ladder before release on numerous quality aspects. Ladder made from 67mm x 31mm x 3.15mm high tensile aluminium 'C' section. steps made from non-slip type fluted pipe. Manila rope and pendulum type lock for extension and locking. 12" x 2" wheels will be provided for shifting ladder and 50 x 50 x 14 gauge ms square pipe fabricated handle providing for ladder shifting. Working platform, railing and safety belt will be provided for easy working. 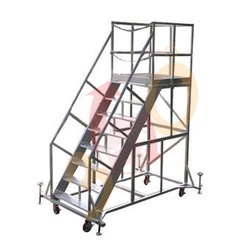 Our organization is engaged in offering a wide range of Aluminum Trolley Ladders. These ladders are manufactured using high tensile alloy, which is sourced from the most reliable vendors of the market. The offered ladders are available in various specifications to meet the diverse requirements of our clients. We provide Jeep Mounted Tower Ladder with excellent properties. This Tower Ladder, we provide, is mounted on Jeep that allows flexibility in working system. This Mobile Tower Ladder has total MS frame and nut bolt fittings. 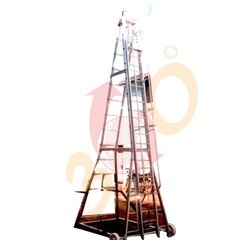 We provide the Jeep Mounted Tower Ladder in the market at affordable price. 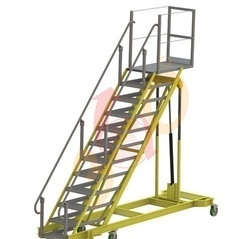 Being a leading enterprise of this industry, we are offering a huge range of FRP Trolley Step Ladder. Looking for Trolley Step Ladder ?